Onefeed is one of those extensions for Chrome we can not miss if our social life is very active network. 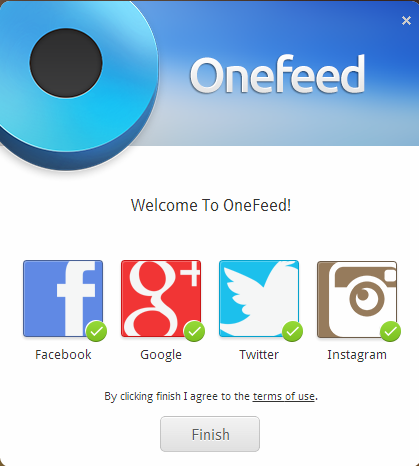 What makes Onefeed is to unify all access to our social networks and RSS feeds, in one place, through a well structured interface, although by default only connects us directly to Facebook, Google+, Twitter and Instagram, most used social services. Once we’ve added the extension to Chrome, will open a new window so we can choose which social network we connect. Using a Speed-dial (reminiscent of Opera), we will have at the fingertips all the social sites, to which we can add other links as our Google Drive or Dropbox account. The bottom of the screen displays bigger boxes with some of our RSS feeds, which can be added through the options, simply placing the link to our news site of our preference. Even the reader divides the news feeds of those that come from a social link or the more traditional. Anyway, there is a search box and the ability to add tags to locate them more easily. With respect to social networks, we may receive notices about new posts as Onefeed warn us. The same will happen if we link our Gmail account, and notify us when entering new messages. Such notices can see through the tiles for each, as well as RSS news items, which are integrated in a very colorful with the rest of the interface. In short, one of the extensions install more worthwhile for those who do not care about the little details, plus some privacy; the bad news is that it is very invasive with the browser, because it can read and modify browsing history or manage applications, extensions and themes (sic) also lacks some customization options, such as to change the background color or change the size of the tiles.